Down to the details. 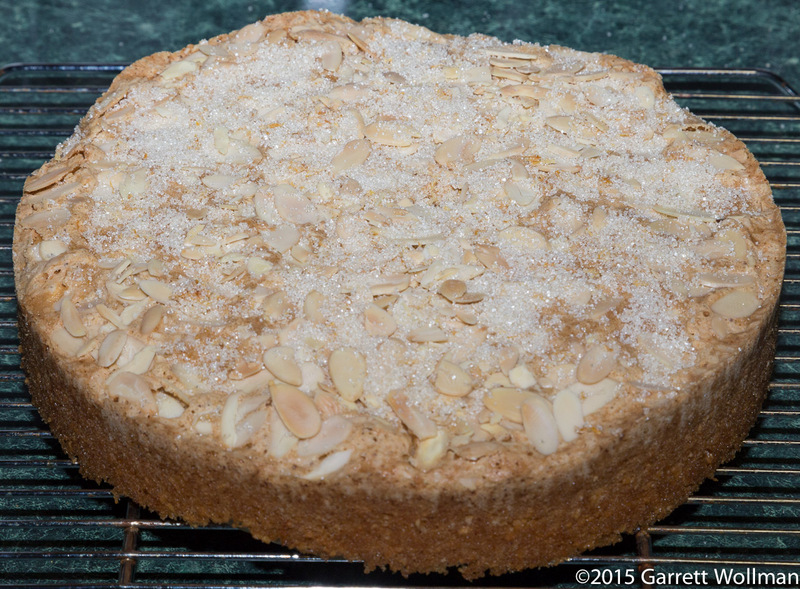 The recipe, “Best Almond Cake” ($) appeared in the January, 2014, issue of Cook’s Illustrated , and was featured on America’s Test Kitchen episode 1502, “Almond Cake and British Scones” — although in this case regular TV cook Bridget Lancaster (the only regular on the TV show who doesn’t also appear on the magazine’s masthead) presents the recipe rather than the magazine article’s author, Assistant Test Cook Sarah Mullins. The recipe starts out by toasting blanched sliced almonds, which are used in two ways: first, they are ground and mixed with the other dry ingredients of the cake batter, and then later, more toasted almonds are used to top the cake. 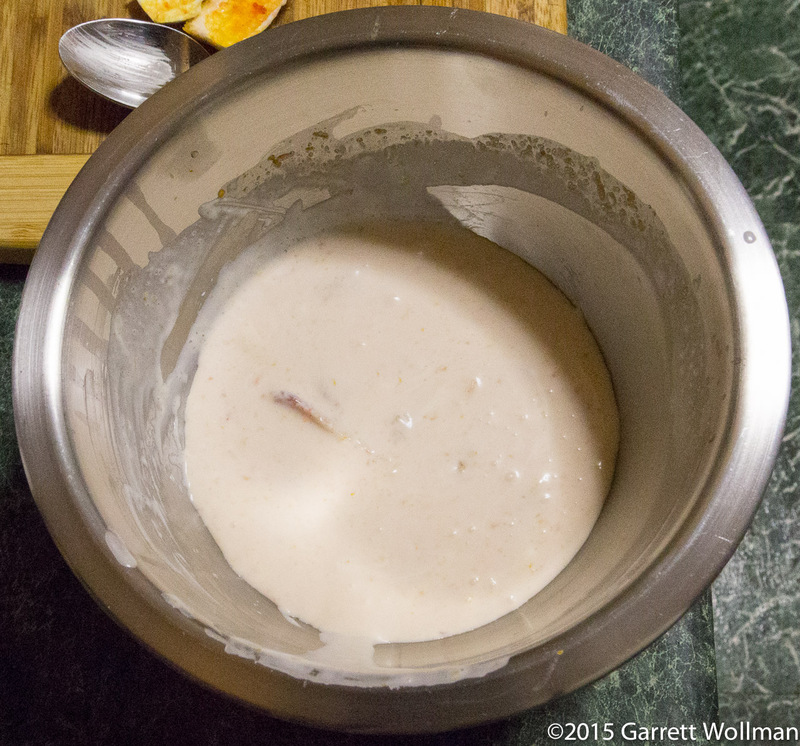 The fats — a mixture of vegetable oil and melted butter — are added to the egg-sugar mixture, with the processor running, to create an emulsion, and then the almond-flour mixture is pulsed in until just combined. 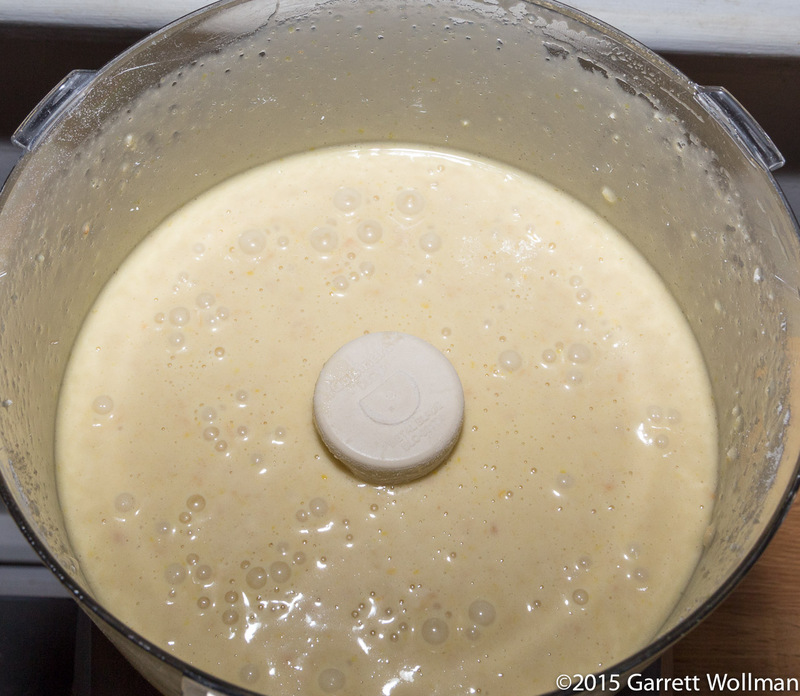 The resulting batter comes just up to the capacity line in my food processor, as shown in the photo above. 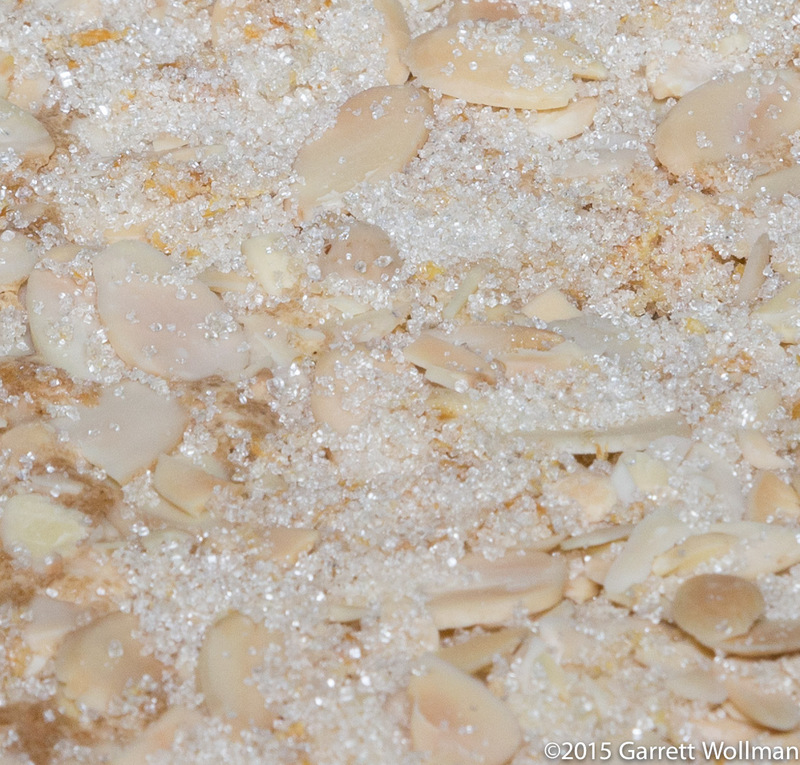 This is then poured into a greased and lined cake pan — I used a springform pan for ease of extraction — and topped with more toasted almonds and a mixture of sugar and lemon zest. This is then baked about an hour at a fairly low temperature (only 300°F). After cooling in the pan for a quarter of an hour, the cake is extracted (again, using a springform pan made this easy) and allowed to cool for another couple of hours on a wire rack. I did not care for the sugary topping, which (as shown in this photo) remained fairly loose and granular even after baking. 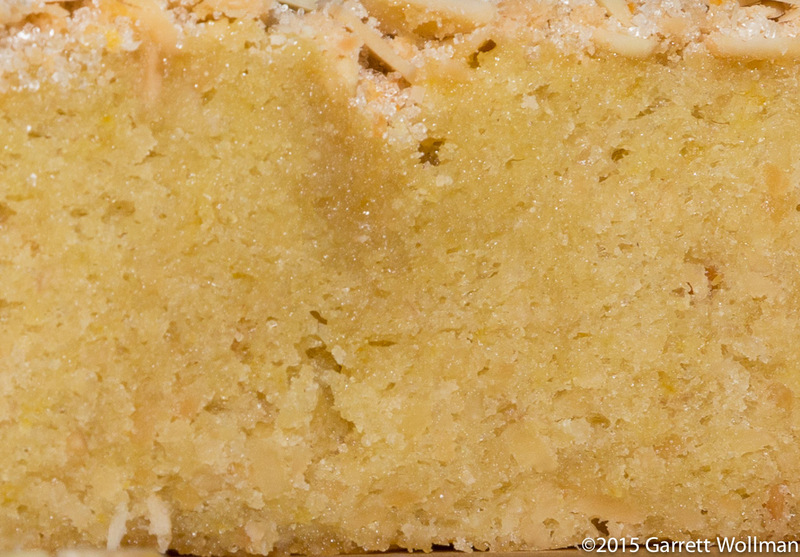 In this close-up you can see that the cake was slightly underdone — I think that’s actually the puncture from where I put my tester in — and could perhaps have used five more minutes of baking time. No complaints, though — as mentioned above, I prefer cakes on the fudgy side anyway! It was very, very tasty indeed, and a great simple sauce; the only thing to keep it from being an everyday sweet sauce is the crème fraîche itself — which although it’s readily available in the supermarket these days is not commonly found in people’s refrigerators. (Of course, you can also make your own, as I discussed last spring, but that requires as much advance planning as it does to just buy it with your regular groceries.) I’ll probably be doing more with crème fraîche later this year as I work through some of Joanne Chang’s recipes where it’s an important ingredient. I brought the cake into work and it was very well received, although a few of my coworkers were a bit dubious about the sauce. That said, I still had a quarter cake left over, which I put out on our tasters mailing-list (a slightly more limited circulation than vultures), and by the time I got out of my after-lunch meeting, it was nearly gone — pretty good for the last week of winter break. I cut the cake into eight slices for service, but once people insisted on further cutting up the slices, I cut the remaining slices in half. I’ve based this calculation on eight slices. 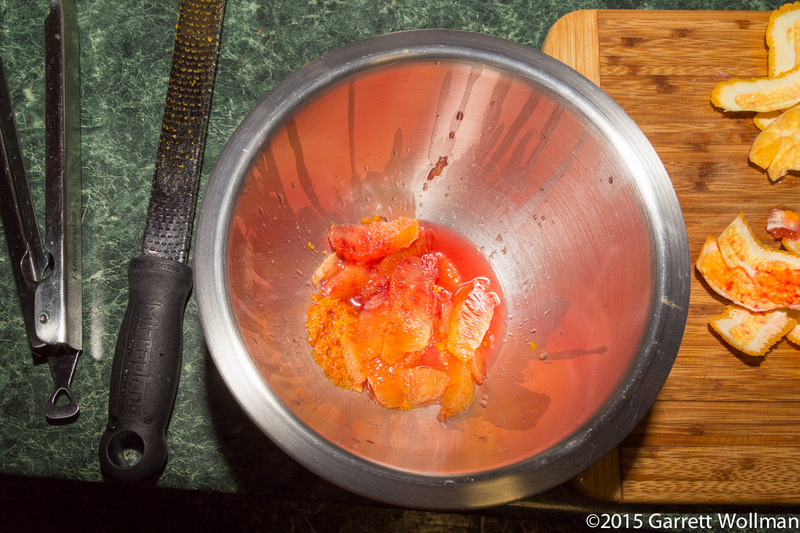 For the orange crème fraîche, I based the calculation on navel oranges (rather than the smaller blood oranges I used) and figured on two tablespoons of sauce per serving (thus 16 servings per recipe). When I brought this into work, I had a significant amount of the sauce left over (which unfortunately I had to toss). This entry was posted in Food and tagged almond cake, America's Test Kichen, Cook's Illustrated, creme fraiche, recipe, Sarah Mullins. Bookmark the permalink.